If you are not aware of ADB, ADB stands for Android Debug Bridge which is a google’s tool. It appears similar to windows command prompt. Let’s see how to setup ADB in your PC. click on build number options 5-7 times to enable developer mode- You will get a message its enabled. 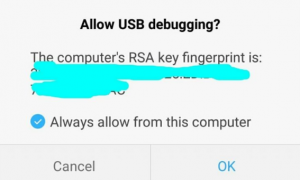 Click on Developer Options and enable USB Debugging mode option. You are partially completed and for the remaining steps you need your PC. Now re-enter the command “adb devices" , You can now see your device’s serial number in the command prompt. That is it , we’ve completed the ADB driver installtion. Now re-enter the command “adb devices" , You can now see your device’s serial number in macOS’s Terminal. That is it, you have set up ADB in your Mac book. Note: If you are stuck, check here for the detailed instructions.